Modern Spa Salon & office reception desk table, receptionist counters for sale. 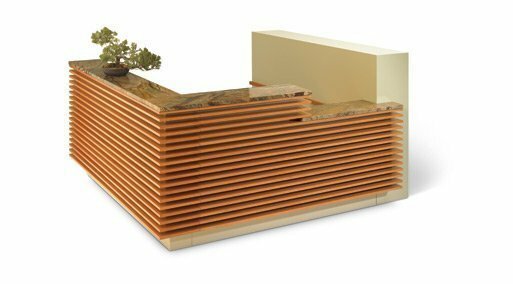 Reception Desk is a free-standing welcome desk in the very front of the office, salon, hotel, hospitals, clinic, club, spa or some other public centers. It’s the first thing that customer will see which they enter inside the building. So receptionist desks are very important in all of those locations. The front desk in a hotel where guests can book rooms or ask services; The front counter in an office where visitors can ask questions; The reception desk in a Clinic office where patients can wait and consult. The salon reception desk can give you a warm welcome and easy guide. Reception Counters plays an important role in almost any types of businesses & services. How to choose a receptionist desk? A right Reception counter style & design have to match the places. A good reception desk has to emphasize the room theme. The reception also has to be a modern look and welcoming externally but useful and functional internally. Because It not only gives a good functional workplace for the receptionist but also matters the brand image even enterprise culture. It’s a real business card for a Company. Therefore, choose the right reception tables & counters are an important issue for your business. Unique Custom design and build salon reception desk, office reception desk & hotel reception counters for sale. We have over 200 models with large various designs and finishes options. Checking Here below catalog and shop with confidence. If you need any custom reception desk. Welcome sent us an inquiry. 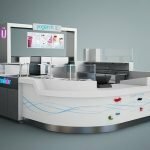 Unique Kiosk has been designing & manufacturing commercial receptionist counters & desks for over years. We have advanced equipment & skilled workers to ensure you get high-quality finished products. There are several characteristic features of our reception display furniture. Since we are offering custom reception design service, Our reception desks are available in a variety of design shapes like an L shaped reception desk, S-shaped receptions, U shaped reception desks, curved reception desks and round shaped receptions counters. You can have any ideal shapes for your business desk. From a wave line style to organic or geometry out looking. 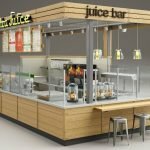 We provide unique design service for your dreamed counter desks. Curved & round reception counter and reception table are usually used as an information center. So, people can easily access from all sides. usually used in hospitals, airport, and train station. For different locations and spaces, we have accommodated size receptionist desk for you. We design and build receptions according to the given size & dimensions. Usually, the reception counter size is 1.5 meter, 1.8 meters,2 meters, 2.4 meters, 3 meters or even longer that based on different shape. The size is determined by the space and whole interior design. The width of the reception desk is usually in 600mm-800mm. While the reception desk height is usually in 1200mm. Most of the desk will be built two levels, front part are higher than the back administrator assistant working area. The working countertop is in height of 750mm for computer area. The front parts are higher to provide a semi-privacy working station. During our past sales data, Small reception counters are most popular . while large receptions are only used in some big office or business center. Working with our designer and get professional expert suggestions for your suitable receptions dimension. In Fact, you can choose any color you want for your reception. But white reception counter and black color are the most popular color. As we know, the Reception counter is used in kinds of formal area. So, you can not make your reception table too colorful. White color gives people a clean and neat feel. While black color represents a noble and elegant level. Dark grey is also used a lot of receptions desk. But other colors if you want to use on your reception desk, you need to make sure it matches your business or shop theme. There are many different materials used in a reception desk. For body structure of the desk, You can choose fire-resistant plywood, melamine or MDF to build it. The surfaces are usually finished with lamination or baking painting (In Australia which is also called 2-Pacs finish). As for countertop, we mainly have three options. Man-made stone reception desk, glass top computer desk & wood textures finish. We have worked with many man-made stone Brands such as HI-MACS ®, CORIAN®, STARON®, LG® etc. If you need a high-quality reception computer desk. Unique will be the best place to go to. How much for a custom reception counter, welcome desk? The price cost of desks & counters is varied from different size and materials. In Unique you have a large scale of options to choose based on your budget. From $300 – $8000 USD, The best seller is a 2-meter long office reception desk with a price at $800. If you want to know a custom reception counter price. Just need to send your favorite design to us and tell us the dimensions of the desk you need. We will offer you the best price cost on it. Where to buy good quality but cheap reception table? The answer is to gets it directly from commercial computer desk manufacturer. 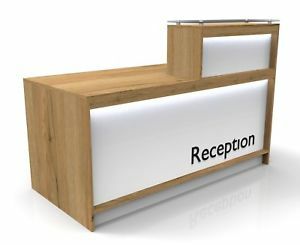 There are many different commercial furniture manufacturers who can do a reception counter. But due to the labor cost and raw material cost. Asian countries are the best place to go to. Our front desk has been ship to many big cities all over the world. such as Vancouver, Toronto, Pretoria, Cape Town, Perth, Durban, London, Sydney and so on. There several features & advantages of our receptions front desk. Directly commercial display furniture manufacturer can offer your more competitive price. 17 years experience in reception solution allow us to offer you a more professional product. We offer best finish reception tables for sale. Free 3D design service, In are 3D Rendering you can more easy to recognize the finished desks & counters in reallocation. Customized offer is accepted. OEM & ODM are welcome all the time. 2 Years-long quality guarantee, Free Order us with confidence. Unique Kiosk is a professional commercial display furniture supplier & reception desk manufacturer, We custom design & manufacture reception desk for sale. No matter you are a wholesaler or final user, here we offer best modern design receptions desks & counter with affordable cost.